James Spithill, the helmsman of BMW ORACLE Racing is the man entrusted with taming the 90-foot by 90-foot behemoth the sailing cognoscenti has dubbed 'Dogzilla'. He appears to have been made for the challenge. Spithill was barely out of his teens when he burst onto the America’s Cup scene as the skipper of Young Australia, a youth challenge for the oldest trophy in sport, that turned heads in 1999, in Auckland. Although the team didn’t win often, its lack of experience and old equipment were hurdles too high to climb, they conducted themselves with maturity beyond their years and won enough battles to get noticed. 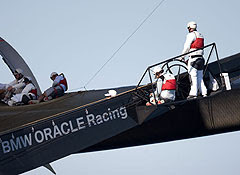 Many from that team have forged careers in the America’s Cup since, including their skipper. Today, at the ripe old age of 30, Spithill, has three America’s Cup campaigns to his credit. He was hired by BMW ORACLE Racing shortly after the end of the last event in Valencia, Spain. He’s now spending the summer in San Diego, conducting sea-trials with the team on their new trimaran. "It's very exciting," Spithill says. "Everyone is refreshed and enthusiastic about this project. Not just the sailors, but the builders, the engineers, the designers, the sailmakers - everyone is doing something that hasn't been done before or pushing the boundaries, so it's a very exciting vibe that's in the team. If I think of just one-boat sailing, like we’ve been doing, you’d probably become pretty bored, pretty quickly, but with this boat, we look forward to every day. There isn’t a dull moment." The goal is to develop a faster multihull than the Defender, Alinghi, ahead of a one-on-one America’s Cup Match scheduled for February 2010. Both teams have created cutting-edge craft that push the boundaries of what is possible on the water. "The level that this boat is at, is nothing has been done like this before," Spithill says with pride. "The power to weight ratio is unbelievable. Nothing any of us have seen comes close to the amount of power this boat generates - the sail plan, the mast height, and just the limits we’re pushing; no one has done this before so it’s pretty exciting. It has been a massive learning curve for all of us." The numbers are astounding. The length overall is 100 feet (90 feet on the waterline). The beam is similar to the waterline length, providing for a very stable platform that is as big as two basketball courts. Stable, until you consider the mast is over twice as long, at 185 feet. The mainsail is nearly 6800 square feet, the headsail 6700 square feet and the downwind sail, the gennaker, measures in at an incredible 8400 square feet. Each sail is about 30-percent bigger than on the old America’s Cup Class boats used in the last edition. The speed comparisons don’t bear thinking about, but BMW ORACLE Racing has flirted with 50 knots. The focus for the summer has been on testing the modifications made to the boat over the spring months: "We’re testing the performance limits of the boat," Spithill explains. "We’ve made some big changes and we’re out there each day, evaluating those. "When we first started sailing the boat we were quite conservative. Now we're carrying quite a lot of power out there, a lot of sail area. It's always in the back of our minds that we have to be very careful testing this boat. One big mistake and the campaign would be over, so we have to be smart about it, but with multihulls you really do have to push to understand their limits." The sailing team will keep working until February, when it will meet Alinghi in what is sure to be an historic event - a best of three match for the 33rd America’s Cup.